There are plenty of ways to make the cake more appealing - Cake toppers being one of them. 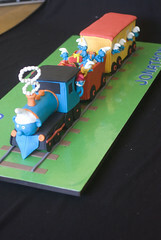 However, if you're party is based on a particular theme, it would be amazing if your cake represents it as well. If your child's birthday party is focusing on the Smurfs, then you're surely going to need some Smurf Cake Toppers. 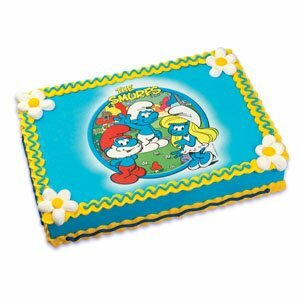 Let's take a look at some of the finest and affordable Smurf Cake Toppers available - both for regular cakes as well as cupcakes. Edible cake toppers are the best because you won't have to remove the sheet whilst cutting the birthday cake. Moreover, they make the cake taste even better. A few hours before the party, remove the topper from its backing sheet and place it on the cake. Once this is done, you could go ahead and decorate the cake even more if you wish. The Cake topper below is both edible and you could even personalize it. The topper measures 8.5X11 inches and hence you should bake a cake of similar proportions. The picture is an actual screen shot from the movie - What could be a better reminder of the awesome movie that it was? It's a scene from when they just entered the city through the wormhole (in the water). Once you order this cake topper, B'day Parites (The manufacturer) would send you an email asking you what you want written. But, in order to get the email, you're going to have to click on Contact B'day Parties after checking out. If at all you fail to send a message, the topper comes with the default: 'Happy Birthday'. Using the Cake topper is similar to the one already explained above. If you want to make the cake stand out, you should definitely add some real figures on top of it. There are plenty of figures that you could add; because, there are plenty to choose from. Let's take a look at ways to decorate your cake using 2 inch figures. There's no end to your imagination and therefore it's up to you to decide what the basic cake topping needs to be. You could just create a park like scene and place the figures on it - these would surely make your child jump for joy; especially if it's a surprise. 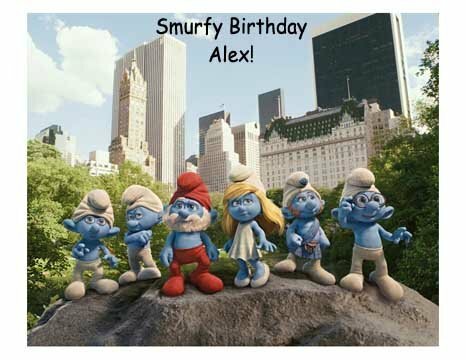 The Smurfs other than Papa Smurf wear white hats, so why not create a matching background? A snowy area wherein the smurfs are busy playing - this would be a great idea for winter birthday parties whether or not it snows in your area. After the party your child would be able to play with the plastic figures and hence there's no waste - it's like an additional birthday gift. When it comes to decorating birthday cakes for kids, in addition to placing cake toppers and figures on the cake, you could also decorate the sides using Pop Tops. Moreover, if you don't want to place figures on the cake, pop tops would look great on top of the cake as well. The Smurf Pop Tops below are approximately 3X3 inches. 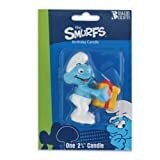 When you think about Smurf cake toppers, we usually forget that suitable candles could be used as toppers too. 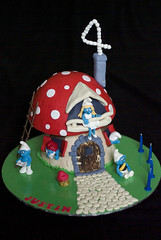 So, if you're cake isn't based on the Smurf theme, you could always place a smurfy candle! 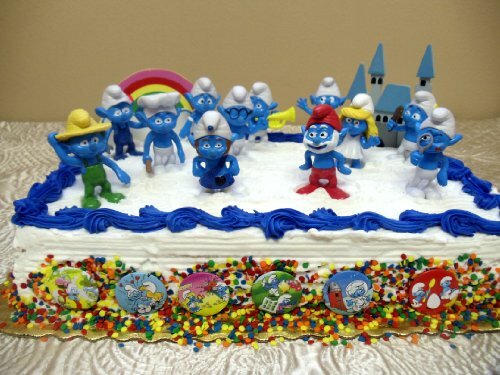 The candle would represent the theme and hence the entire cake would be seen as a smurfalicious cake. Most children birthday parties offer cupcakes rather than regular cake and therefore, there are plenty of options when it comes to decorating your cupcakes to match the party theme. 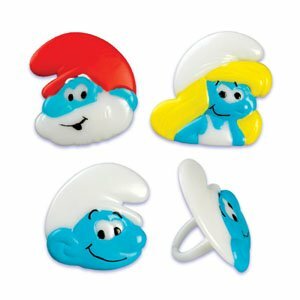 The smurf cup cake rings come in sets of 12, 4 of each kind. They are created for the standard sized cupcakes and help brighten up the cake. 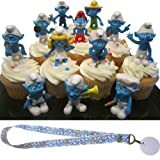 Once your cupcakes are ready for the party, you could garnish them with Smurf Toppers! They're not edible but do look stunning on top of cupcakes. 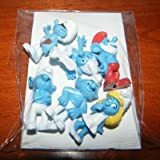 Moreover, these figures are really enjoyable and kids would be able to play with them even after they've finished the cake and the party is over. 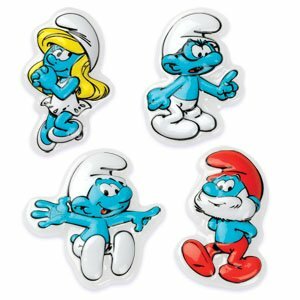 The one to your right and above consists of 6 pieces Papa Smurf, Smurfette and Brainey are the famous ones. Whereas, the one below is a set of 12 pieces and as you can see they look great when placed on Cupcakes. You could also add these figures to your goody bags, they'd make great take away gifts which are also related to the theme.